Glasgow is well served by motorways and A roads, 2 major railway stations and 2 airports. Glasgow - Travel by coach - If you'd like to speak to someone about your journey you can ring Traveline on 0871 200 22 33. There is a Park and Ride at Shields Road. Glasgow - Travel by train - Glasgow Central is the largest railway station in Glasgow, Scotland, operated by Network Rail. It is the northern terminus of the West Coast Main Line. Three train companies are in operation - Virgin Trains - to London (Euston) and the North West, Midlands and South of England - GNER - to Edinburgh, Newcastle-upon-Tyne and London (King's Cross) - First ScotRail - Passenger services within Scotland, and sleepers to London. Queen Street is the other railway station, and is the main gateway to Northern and Eastern Scotland. Glasgow Central Station Simply Food - Unit 14,Caledonia Centre, Glasgow Central Station, 79 Gordon Street, Glasgow, G1 3SQ. Tel: 0141 248 6728. Glasgow - Travel by road - The M8 Motorway is accessible at numerous junctions throughout Glasgow city centre. The M8 Motorway links Edinburgh to Greenock, via Glasgow. Glasgow is about 45 miles from Edinburgh and 25 miles from Greenock. Glasgow - Travel by road - The M 73 Motorway takes traffic from the M74 north for 7 miles past Glasgow where it joins the A80 / M80 (to Stirling). Glasgow - Travel by road - Glasgow is about 6 miles west of Junction 1 of the M 74 Motorway. The A74 and the M 74 Motorway takes traffic from the M6 at Carlisle, north to Glasgow. Glasgow is about 95 miles from Carlisle. Glasgow - Travel by road - The M 77 Motorway and the main A77 takes traffic from Glasgow to Kilmarnock. Kilmarnock is about 25 miles from Glasgow. Glasgow - Travel by road - The M 80 and the main A80 Motorway takes traffic from Glasgow to Stirling. Stirling is about 25 miles from Glasgow. Glasgow - Travel by road - A8/M8 Glasgow east to Edinburgh, and Greenock to the west. A82 to Dumbarton, Loch Lomond and the North West Highlands. A80/M80 to Stirling and the North East. A77/M77 to Kilmarnock, Ayr and the South West. A74/M74 to the South and England. There is a Park and Ride at Shields Road. Air - Glasgow International Airport is located 8 miles west of Glasgow, near Paisley. Paisley's Gilmour Street railway station is the nearest to the airport being two miles from the terminal and can be reached by taxi or bus. The M8 Motorway Junction 28 gives easy access to the airport. 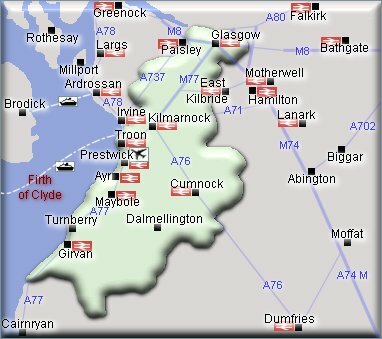 Glasgow Prestwick International Airport is reached via the M77 and "A" class dual carriageway roads and is only 32 miles from the centre. The airport's railway link means it can be reached within 45 minutes. Glasgow Prestwick has 2 short stay, 1 mid/long stay and 2 long stay car parks. Booking recommended for mid to long stay. Glasgow - Car Hire - All major car hire firms have offices in the city and at the airports. Glasgow has approximately 1500 London-type taxis. Glasgow - Ferries - Caledonian MacBrayne operate a service across the Firth of Clyde. SPT run The Renfrew-Yoker ferry. The ferry point is a traditional bus terminus while the Yoker point is a short walk from Glasgow's Dumbarton Road with its regular bus services. Glasgow - Underground - Glasgow, like London and Tyne and Wear has an underground metro system. The Subway has a circular line of about 6 miles, and the tunnels are much smaller than those of the London Underground. Discovery tickets available. There is a Park and Ride at Shields Road. www.spt.co.uk. Tel: 0141 332 6811. Glasgow - Tram - 1962 saw the end of trams in Glasgow. Glasgow is 400 miles from London, 300 miles from Birmingham, 45 miles from Edinburgh and 150 miles from Aberdeen. Glasgow - Shopping - Marks & Spencer Bearsden Simply Food, 134/138 Drymen Road, Bearsden, Glasgow, Tel: 0141 942 6390. Marks & Spencer, 49 Braehead Shopping Centre, Kings Inch Road, Glasgow, Strathclyde, G51 4BP. Tel: 0141 886 4391. British Home Store Braehead - Unit 173 Braehead Shopping Centre, Kings Inch Road, Glasgow, G51 4BS. Tel: 0845 8410145. British Home Store Glasgow - 67-81 Sauchiehall Street, Lanarkshire, G2 3DA. Tel: 0845 8410187. British Home Store St Enochs - Unit 1 55 St Enochs Square, St Enoch Centre, Glasgow, Lanarkshire, GL 4BW. Tel: 0845 8410268. Burton Retail Glasgow - Tel: 01413532246. c/o Dorothy Perkins, The George Unit1&2, 229-249 Buchanan Street, Glasgow, Glasgow City, G1 2NG. Burton Retail Braehead Park - Tel: 01418859245. 144-145 Braehead Shopping Centre, Kingsinch Road, Braehead, Glasgow, Glasgow City, G51 4BS. Glasgow - Sport - Glasgow Rangers Football Club, Ibrox Stadium, Glasgow, Scotland. Tel: 0141 5808500. Glasgow Celtic FC, Celtic Park, Glasgow, G40 3RE, Scotland. Tel: 0871 226 1888. Glasgow - Sport - Ten Pin Bowling, hollywood bowl Glasgow, Showcase Leisure Park, Barrbridge Road, Bargeddie, Glasgow, G69 7TZ. Tel: 01236 425 222. ICE SKATING. BRAEHEAD ARENA, Braehead Shopping Centre, Kings Inch Road, Glasgow G51 4BP. Tel: 0141 8868300. Alexandra Park Golf Club, Alexandra Park, Dennistoun, Glasgow. Tel: 01415561294. Bearsden Golf Club, Thorn Road, Bearsden, Glasgow G61 4BP. Tel: 0141 586 5300. Situated between Glasgow and Dumbarton. The Bishopbriggs Golf Club, Brackenbrae Road, Bishopbriggs, Glasgow G64 2DX. Situated to the north of Glasgow. Tel: 01417728938. Calderbraes Golf Club, 57 Roundknowe Road, Uddingston, Glasgow G71 7TS. Situated beside Glasgow Zoo off the M74. Tel: 01698813425. Glasgow Golf Club, Killermont, Bearsden, Glasgow G61 2TW. About 4 miles NW of Glasgow. Tel: 01419422011. University of Strathclyde Drama Centre, 98 Ingram Street, Glasgow, G1 1ES. Tel: +44 (0) 141 548 2542. Theatre Royal, 282 Hope Street, Glasgow, G2 3QA. Phone Sales: 0870 060 6647. (booking fee). Tron Theatre, 63 Trongate, Glasgow, G1 5HB. Box office: 0141 552 4267. Cineworld Cinema, 7 Renfrew Street, Glasgow G2 3AB. Tel: 0871 200 2000. Cineworld Cinema, Forge Shopping Centre, 1221 Gallowgate, Glasgow G31 4EB. Tel: 0871 200 2000. Royal Concert Hall, 2 Sauchiehall Street, Glasgow. G2 3NY. Tel: 0141 287 5511. National Theatre of Scotland, 45 Hope Street, , Glasgow, G2 6AE. Tel: 0141 221 0970. For hotels in other areas nearby see Loch Lomond hotels & Greenock hotels. 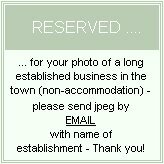 For bed and breakfast in other areas nearby see bed and breakfast in Loch Lomond & bed and breakfast in Paisley. 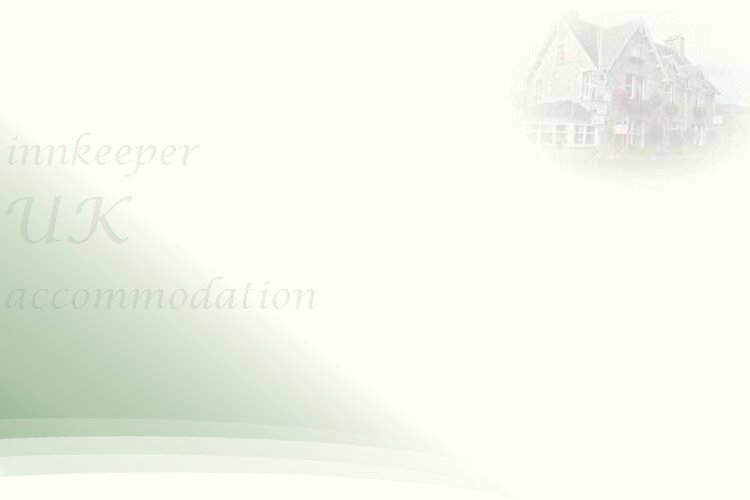 For self catering accommodation in other Lanarkshires near to Glasgow Lanarkshire see self catering accommodation in Falkirk & self catering accommodation in Edinburgh.